Last week, I made these yummy Taco Bowls. I really liked the little bowl idea and it was definitely less messy than a regular hard taco. I immediately started thinking about all the other things we could put in a tortilla bowl ~ buffalo chicken, bbq, etc. ~ the possibilities for savory fillings were almost endless. Then I remembered the tasty Cinnamon Snowflakes we made during the winter and a little lightbulb went off in my head... I could make a dessert version of these bowls!!! Yummy Cinnamon bowl, vanilla pudding, strawberries and whipped cream! Since it was a gorgeous day out today and I had no intentions of spending a lot of time in the kitchen, I kept it simple ~ instant vanilla pudding and fresh sliced strawberries. However, as with the savory bowls, you have tons of possibilities for fillings. I'm think I might even try some pie fillings next time for little mock fruit pies. 2. Make the pudding according to package directions. Put in the fridge to set. 4. Brush the inside of each tortilla bowl with melted butter or spray with cooking spray, then sprinkle with cinnamon sugar. 6. Allow the shells to cool, then spoon in the pudding, add the strawberries, top it off with a squirt of whipped cream and serve!! 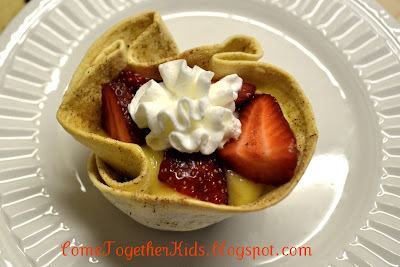 We really liked the combination of the cinnamon, vanilla pudding and strawberries. It was fun to scoop out a few spoonfuls of the filling, then just pick up the whole bowl and eat what was left. Thanks for linking up at my place! I'm your newest follower and I'm so glad I found you - er, you found me! How creative, these are sooo cute too!! Love all your ideas - thank you for sharig! Popping in from Reasons To Skip the Houseworks's link up party! Those dessert bowls look so good! I'm an definitely making those with the spare tortillas I have in the fridge! Those look so good! Definitely have to make those bowls for all kinds of yummy dinners. Taco salad, here I come! We've done the taco bowls, now ready to try the dessert ones. Great ideas!! I think I would enjoy these...but my boyz (5 and 3) have not developed good taste buds yet...they don't even like whipped cream! So sad! But...more for me. Thanks for sharing. Comin at cha from FTLOB! Those look yummy! I will have to try it! Visiting from Night Owl Crafting! Thanks for sharing! Oh My! Sounds SO YUMMY!! I'm definitey going to try these! Would make an easy treat to take to church or other events too. These sound fantastic! Great idea! Thanks for sharing. OH MY goodness! I do cinnamon sugar chips similar to this but pudding and strawberries take it to a whole new level. These looks so delicious! I love the tortilla idea, so pretty! What a perfect and clever sweet treat! Super idea...a good way to add texture...crunch + creamy is the way to go!! Thanks for linking up to Foodie Friday. Oh, and if you haven’t done so already - don’t forget to pop on over to Little Brick Ranch to enter the GIVEAWAY!!! I’ll give you a hint...Homes, Food, and all things Frugal!! The shape of the bowls is so pretty. I love how they look almost floral. Thanks for linking up with us : ) Have a great weekend! How fun. What a great way to make a dessert stand out. So cool! I'll have to try this! Thanks for sharing ~ come by and say hi sometime! Love this idea! Seems easy to make, but looks like a fancy dessert - thanks for sharing! oh wow these look yummy! so good. 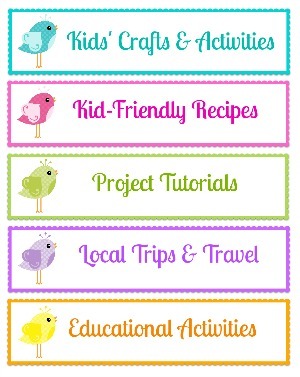 I featured this today on Fun For Kids Finds. Yummmm! I know it's an older post, but I'd love for you to link this up to my blog hop if you have a chance! 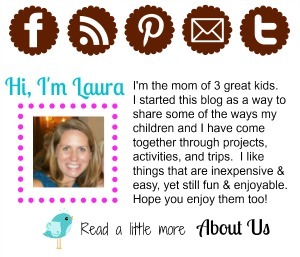 I absolutely love your fun recipe ideas!!! Thanks for sharing! good Various smart devices have Unknown Sources location at showbox apk cover all the features of the options applications of nice. good the components. To set up Mobdro on Kodi, Mobdro for Kodi Wait on couple of minutes and also check for the schedule. best.